Those who work out with a partner they feel comfortable with are more energetic and happier than those who work out alone, according to a report by Santa Clara University scientists. Having that in mind we decided to pick not only one student of the month but two. And because they are a couple they didn’t mind sharing the illustrious title. Isabel and Miguel have been attending Tempo Pilates classes since 2014 and during their interview, they chatted about their reasons for joining Tempo Pilates, their favourite reformer moves and the changes they noticed since starting their Pilates journey. TP: What made you start practising Pilates, and why Tempo Pilates? Miguel: Pilates was recommended to us by a friend as a good way to keep fit. 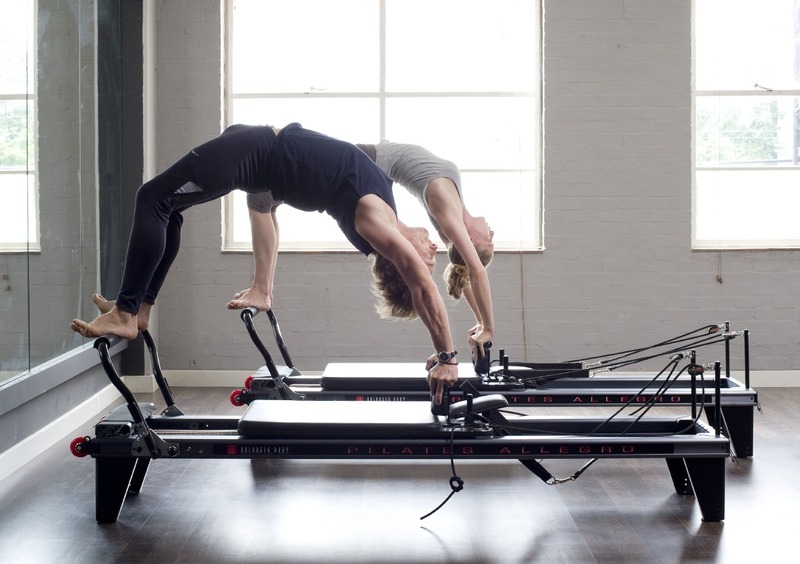 We searched online for somewhere near home and found Tempo Pilates E8 | Hackney. I think Pilates sessions at Tempo Pilates are quite a different experience from mat Pilates, it enables you to carry out beneficial exercises with relative ease and it’s also a lot of fun. TP: Have you noticed any changes since you started practising? Miguel: Yes, far more core strength (I can hold a plank for 6 minutes! ), better posture at the office and definitely more flexibility, especially in my hamstrings. TP: What is your favourite Tempo move/exercise and the one you find the most challenging? Isabel: For me, the most challenging move is the single leg shoulder bridge. Miguel: Planks are my favourite but because I can now hold them for longer. I find lunges on the reformer quite tough still. TP: How would you guys describe Maureen’s classes? Maureen is the best instructor ever, she’s professional and friendly and she is a great motivator – always ready to challenge us. She is brilliant and always knows how to modify and accommodate anyone with an injury. We sat down with trainer Claire Coles for our first OFF REFORMER chat to find out more about her, what is exciting her at the moment and we also spoke about her career move from a primary school teacher to the Pilates world. TP: So from Primary School teacher to Pilates trainer, what a change. How did the decision to change careers come about? Claire: I was living in the US, teaching at a kindergarden school and had been attending Pilates classes for over two years. I was excited by the effect it had on my mind and body so I decided to study and become a trainer. First classical mat Pilates followed by reformer, as it was my favorite work out. After my training was over I started to think of what my next move should be, and while researching Reformer Pilates studios I found out about Tempo Pilates and loved the idea of synchronising movement to the music. I was also always excited about the idea of living in London, so being a trainer at Tempo was kind of meant to be. TP: What do you like the most about Tempo Pilates? Claire: I like the intensity of it, fast paced exercise to music. I feel you can work out and also stretch on the reformer, so it’s a very versatile way of exercising. I also found that it was the workout with the quickest results! People have the idea that Pilates is not a real work out and usually compare it to yoga but they should definitely try one of our classes. TP: Aside from Pilates, what is your favorite workout? Claire: I love dancing, as a hobby and as an exercise. Claire: I would love to take on meditation but I haven’t done yet. I like to go home and cook a lovely healthy meal and relax, read a book, have a glass of wine. I am also very into podcasts now. TP: What book are you reading now? Claire: I am reading The Secret written by Rhonda Byrne, I find it very useful. TP: What is your favorite song to work out to? Claire: Beyonce! (laughs) or any R’n’B music. Claire’s classes are fun, energetic and we love the Northern charm she brought to our studios. If you want to read more about Claire click here, or to catch one of her classes check the schedule on our website! This is a great Pilates studio, small and beautifully designed with very friendly and helpful receptionists and professional instructors. I decided to try Tempo Pilates after having suffered with back pain for over 6 months, and felt better after just one session. I can’t recommend it enough. Thank you Malin for another 5 Star review for our London E1 | Shoreditch studio. Welcome to the Tempo Pilates blog, which this month is all about food, or more specifically, organic food. So, you’re trying to eat healthy, and you know that means eating plenty of fruits, vegetables, whole grains, and lean protein. But as you wander the aisles of your local supermarket checking out the fresh produce, you realise there’s another choice to make: Should you buy organic? The health benefits of organic food are touted daily in the media, but while most of us believe that foods labelled ‘organic’ are better for our health, is this actually the case? Truly organic foods are meant to limit the number of synthetic materials used during production, providing us with cleaner, ‘whole’ food alternatives. But in order to find truly organic foods; you have to know what to look for. So, what makes food ‘organic’? Organic crops are grown without the use of poisonous man-made processes and chemicals such as pesticides, fertilisers, genetically-modified organisms, or chemical additives. Meanwhile, to be categorised as ‘organic’, livestock must be raised without the use of antibiotics, growth hormones, or animal by-products. They must have access to the outdoors and be given organic feed. Advocates say organic food is safer, more nutritious, and often better tasting than non-organic food. They also say organic production is better for the environment and kinder to animals. And more and more shoppers seem convinced. Even though organic food typically costs more, sometimes a lot more, sales are steadily increasing. In general, organic operations must demonstrate that they are protecting natural resources and conserving biodiversity. So, for example, while conventional methods involve spraying synthetic chemical fertilisers to promote plant growth, organic farmers apply natural fertilisers such as manure or compost to feed the soil and the plants. Where the conventional farmer would use insecticides for pest control, the organic farmer would make use of insects, birds or traps. And where the conventional farmer might use herbicides for weed control, the organic farmer would rotate crops, till the dirt and weed by hand. Similarly, producers of organic beef, pork, poultry and other meats use preventative measures such as rotational grazing, a wholesome diet and plenty of access to the outdoors, in contrast to the conventional producers who give animals hormones to spur growth and antibiotics to prevent disease. When it comes to pesticides, the evidence is pretty conclusive. Pesticides are poisonous to us, yet over 3,800 brands are approved for use in the UK with conventional farming. Some of the fruit and vegetables we buy are sprayed up to ten times before reaching supermarket shelves. Some pesticides have been shown to cause serious health problems such as cancer, miscarriages, and sterility. Unfortunately, you can’t wash pesticides off the food you eat. The only way to avoid them is to eat organic. There are also environmental factors at play. Improperly applied pesticides can contaminate our waterways, with major consequences, such as toxic algae blooms that can be fatal to livestock, wildlife, marine animals and even us. This is not only a problem for us, but for future generations. There is ongoing debate about whether organic food is more nutritious for us than conventionally produced food. But the latest scientific research suggests it is. A study led by Professor Carlo Leifert of Newcastle University found that organic fruits and vegetables contain a substantially higher amount of antioxidants (between 19% – 69%), which are believed to reduce the risk of heart disease and many cancers. While milk from organically-fed herds has antioxidant levels up to 90% higher than milk from conventional herds. So we’ve established that organic food is good for us. But how can you be sure you’re buying organic? Look at the label. For foods to be labelled organic, at least 95% of the ingredients must come from organically produced plants or animals. EU rules require organic foods to be approved by an organic certification body, which carries out regular inspections to ensure the food meets a strict criteria relating to production methods and labelling. Look for labels like the Soil Association. This is the gold standard of organic labelling. In addition, you can recognise organic produce by the use of logos from accrediting bodies, such as OFF and SOPA, or by the EU license code number printed on the packaging. You can find the list of UK codes here. Where can you buy organic food? Organic food is widely available now. You can buy organic products in all the major supermarkets, online from stores such as Abel & Cole, and of course you can buy straight from an organic food market. They have popped up all over London in recent years; in Covent Garden, Shoreditch and London Fields for example. What are the top ten organic foods to buy? If you’re wondering which foods are best to buy organic, here’s my top ten. Conventional farmers can legally use up to 320 pesticides. Almost half of our fruit and vegetables are contaminated. Peppers are one of the worst vegetables for pesticide contamination. food almost never contains traces. Pesticides, growth hormones and antibiotics in chicken-feed pass from the chicken to their eggs. Just think of all the dishes you make using eggs, from pasta to cakes – the chemicals originally found in the feed will end up there too. Not all produce is grown equally; some fruits and vegetables are more likely to have pesticide residues. Apples are at the top of the list but, the good news is, their organic counterparts are relatively easy to find and not terribly expensive. The humble white potato can contain up to 37 different types of pesticides. Try swapping your white potatoes for the sweet variety, as they’ve been shown to contain far fewer chemical residues. While milk is a natural product, the antibiotics and hormones that go into high-yield cows certainly aren’t. Organic milk meanwhile has higher (up to 68%) levels of vitamin E, essential fatty acids and antioxidants. Poor spinach. It’s one of nature’s most healthy foods, but it has a bad rep. Not only is it regularly featured on pesticide-occurrence lists, but it has been linked to E.coli. Food health experts say the germ can be spread a multitude of ways — by manure, by contaminated irrigation water, by farmhands relieving themselves in the field, by inadequate washing by processors, by insufficient refrigeration that promotes the growth of bacteria in sealed bags of salad greens. Conventional mushrooms are treated with fungicides and insecticides. Organic growers aren’t allowed to use them and must steam-clean their sheds. goodness in a process that uses a chemical solvent. The oil is then chemically bleached, and two controversial preservatives, BHA and BHT, are added to it. Some research links these to cancer. can’t be bleached, and any deodorisation must be done with steam. Like many processed foods, yoghurt contains chemical additives to add colour, flavour and consistency. There are 329 additives, some of them highly controversial, permitted in non-organic food. These include the sweetener aspartame, flavouring MSG and the artificial yellow colour tartrazine. Organic food processors can use only 32 additives and they must come from natural sources, such as vitamin C from lemon juice. Are you familiar with clean eating? Do you know difference between eating clean and eating organic? I ask because I’ve heard many people say “I eat organic and I’m not seeing results”. Eating clean consists of eating whole foods in their most natural state. It means not eating processed foods like white breads/rice/pasta, refined sugars, fried food, fast food, etc. Organic foods are foods that have been grown without synthetic pesticides, fertilizers or sludge, plus they can’t be genetically engineered or irradiated. You may “think” because you are eating organic, that you are eating “healthy”. But if you are not eating foods in their whole form and are purchasing pre-made foods, you’re not living as cleanly as you could. If in doubt, check the label! Here’s the part of the blog where we answer your burning questions about Reformer Pilates. So if you’re wondering which Reformer exercise will best target your gluteus, or why your abs shake while you’re holding your plank, post them below, Tweet us, or send us a message on Facebook. Q: Sometimes when I participate in a Tempo Pilates class, I start to feel really shaky and nauseous. Why is this? A: It sounds like you might be skipping a meal prior to your Tempo Pilates class, which can bring on a hypoglycaemia attack, which is where the level of glucose in your blood drops below normal. Try and eat a fast releasing carbohydrate snack 10-15 minutes before your class. Your best choices are bananas, raisins, pears, grapes, watermelon or blueberries. Q: My reason for joining Tempo Pilates is to improve my strength. Have you got any tips on how my diet can support this? A: Eating around your training is vital to your progress, and nutrition will have a significant impact on your results. Research indicates that what you eat before, during, and after your workout may be the difference between meeting your goals and falling short. We’re led to believe that carbs are bad for us, but the truth is, carbs equal energy. When we eat them, they break down into glucose, enter our muscle cells, and give us fuel to exercise. If you’re strapped for glucose during your workout, you’ll feel weak, tired, and tempted to call it quits. Before a workout, it’s good to eat simple carbohydrates, because they’re digested fast and provide quick energy. Try a granola bar, a piece of fruit, oatmeal, or some dried fruit. Protein after a workout is a must for speedy muscle recovery (particularly after weight training). As the body is continuously breaking down proteins, your diet must provide sufficient amounts. Although the recommended intake depends on body size and level of activity, a post-workout protein heavy meal is universally helpful to kick start muscle repair, recovery, and growth, and in turn increase strength. Tofu, beans and fish are good bets. Q: I’ve started Tempo Pilates with the hope to lose a few pounds. Do I need to cut out fat from my diet to do so?